The sketch artists provided their own perspective of the scene in the courtroom when John Martorano testified at James “Whitey” Bulger’s trial. Hit man John Martorano was on the stand, his chilling testimony gripping the packed courtroom. But a few people sitting in on the James “Whitey” Bulger trial were focused on more than just Martorano’s words. 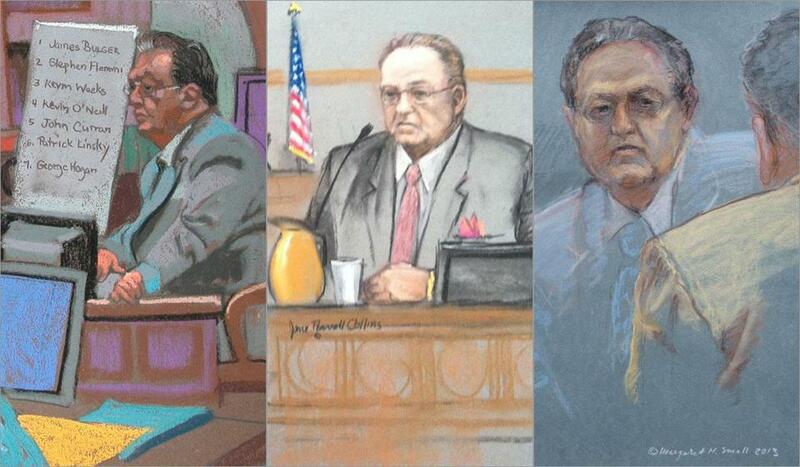 “His hairline drives me crazy,” said Jane Flavell Collins of Duxbury, one of three sketch artists at the Moakley Courthouse recently trying to nail the aging gangster’s look. The veteran artists peered through their binoculars to get a closer look at the judge and other principals. As they drew, their smudged hands were in near-constant motion, giving the world a glimpse into a courtroom where cameras are not allowed. In an age when images are effortlessly captured on cellphones, the sketch artists’ oversized construction paper, erasers, and messy pastels are decidedly old-fashioned but powerful. Here’s another challenge, one that’s familiar to law enforcement: capturing Bulger. The man who is the natural focus of the courtroom action has for the most part turned himself into almost a black hole of whiteness, a pale, still figure glimpsed primarily from the back and the side by the artists, who sit in the audience section facing the judge, not the defendant. The women drawing the trial are art school graduates, all freelancers who make arrangements with various media outlets, and all veterans of many high-profile cases. With their oversized portfolios and boxes of crayons and pencils, they add an air of times gone by to the courtroom as they rough out their scenes, then add or take things away as the day proceeds. Unlike photographers, they can draw figures closer together than they are, to show several at once. With global interest in the trial intense and media space tight, only two artists have a spot on the “media sketch” bench in the front of the audience section. By prior arrangement, Collins and Small have these seats, meaning that Cornell has to arrive early to snag one of the 15 or so seats open to the public. On a recent day, that meant leaving her New Jersey home at 2 a.m. and arriving at the courthouse at 6:15 a.m. When she finally landed the aisle seat she wanted in Courtroom number 11, she relaxed. “I’m about to burst into song,” Cornell said, taking out her tools and starting her workday more than six hours after leaving for work. Although few if any courtroom sketch artists achieve fame, their work has let curious Bostonians see defendants including shoe bomber Richard Reid (drawn by Collins), former House speaker Salvatore DiMasi (drawn by Collins and Small), and Bulger’s girlfriend, Catherine Greig (drawn by Collins and Small). Although courtroom artists have some license, as journalists they will not switch things around for art’s sake and they don’t make criminals look sinister if they don’t in real life. Collins, for example, heard testimony about Bulger’s alleged crimes and yet appreciated his appearance. “He has wonderful even features and a perfectly shaped head,” she said. Collins, who also enjoys painting landscapes and still lifes, followed her sister, the well-known (and now retired) Constance Flavell Pratt, into the field. At Collins’s first trial, an arraignment in Suffolk Superior Court around 1980, she was so eager for a good view she sat in the defendant’s chair — a mistake she has not repeated. Cornell got the bug as a teenager, when she tagged along while her older sister covered trials for WCBS radio in New York. Electronic media coverage of criminal proceedings in federal courts has been expressly prohibited since 1946. But with photography and video becoming an ever larger part of American life, a 1991 pilot program allowed cameras in civil proceedings in some federal trial and appellate courts. That lasted for three years, but a study found that the intimidating effect of cameras on some witnesses and jurors was cause for concern. Another pilot program is underway, this one allowing 14 trial courts to videotape civil proceedings — including those in Massachusetts — and post the content online. The pastel might not be mightier than the lens, but some subjects try to stare down the artists, and others try to art-direct their portraits. When New York real estate magnate Leona Helmsley faced federal tax evasion charges in 1989, she took a moment out from thinking about her defense to make her case to Cornell, who was drawing the trial for NBC. If Martorano had an opinion about how he looked in recent drawings, he was not sharing it. When asked by a reporter whether he was pleased with his likeness as he left court , the former hit man allowed himself a silent chuckle but kept moving.